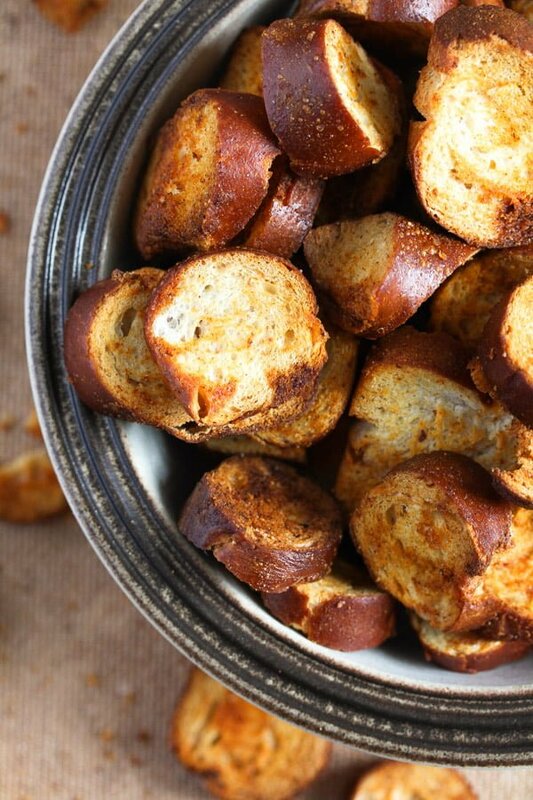 Crispy and utterly delicious homemade pretzel chips. 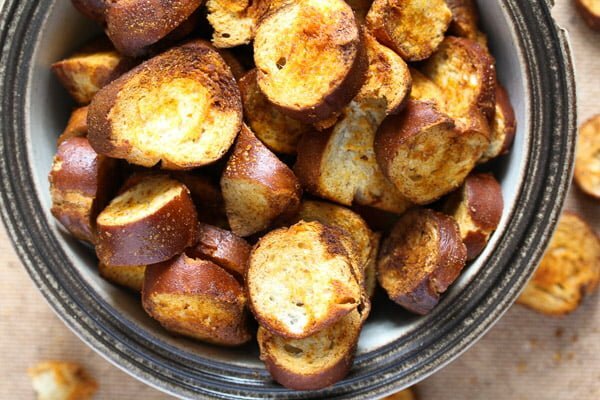 Made with leftover soft pretzel, some olive oil and some spices, this is one of the easiest homemade snacks I know. Not to mention one of the tastiest as well. A very easy, quick, cheap and totally delicious recipe today: homemade pretzel chips made out of leftover soft pretzels. I do love leftover recipes, I hate throwing away food and I am always searching for ideas for using up whatever leftovers I happen to have. 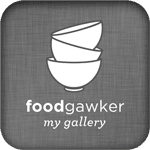 I am an expert in using leftover hard-boiled eggs, there are lots and lots of wonderful recipes using leftover hard-boiled eggs on Where Is My Spoon. Have a look at this Creamy Deviled Egg Pasta Salad with Bacon, these Hard Boiled Eggs in Mustard Sauce or this Egg Salad or Egg Sauce with Greek Yogurt and Chives, these are just a sample of my favorite leftover eggs recipes. 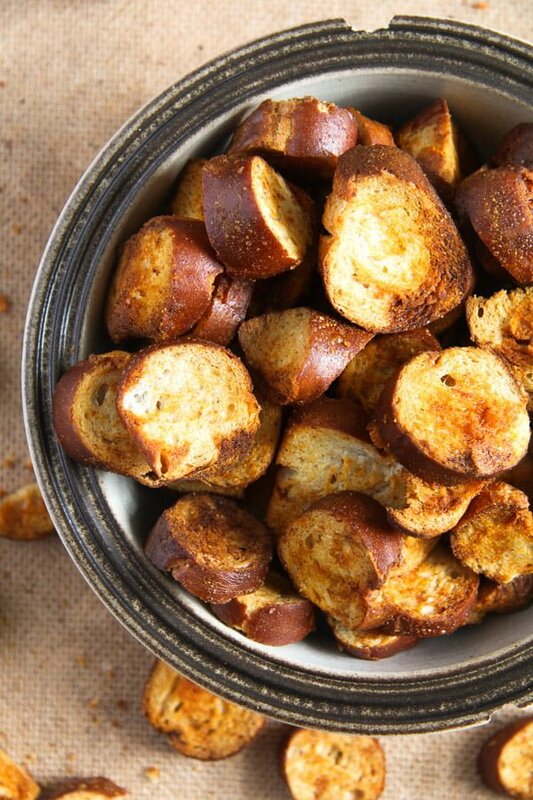 When it comes to bread, it does happen quite often that we have some leftovers that nobody wants to eat anymore. German bread is excellent, it tastes better than any other bread I have ever had, it is almost always sourdough bread and that helps it keep longer as well, and actually become tastier with every passing day. But what to do with white breads? Or things like pretzels or rolls? I mostly make breadcrumbs with leftover white bread or rolls (German rolls do not contain butter or sugar like the typical American dinner rolls, just flour, water, salt and yeast). I cut the bread or the rolls or break them into small pieces, leave them on a baking sheet until they are completely dry, then process them in the food processor until they turn to breadcrumbs. But soft pretzels? What to do with them? We had brunch guests a few weeks ago and, as usual, I exaggerated with the amounts of food I served. Between other things, soft pretzels as well. We all love a fresh, salty pretzel smeared with a little butter or Camembert and cream cheese spread, but if there are also rolls and pumpernickel and so many other things on the table, you really do not manage to eat a whole large soft pretzel as well. So, you make pretzel chips. And trust me, no matter how delicious the fresh soft pretzels are, you will probably like the pretzel chips better. So crispy and crunchy and spicy, once you start eating them, you will have difficulties stopping. Making the pretzel chips or pretzel crisps at home is very easy. Step 1: Cut the old pretzels into pieces. Cutting regular pieces is very important, probably the only thing you have to do carefully when making the recipe. The actual size of the pretzel chips is not that important, you can cut them thinner or thicker, depending on your taste, just make sure that they are all equally thin or equally thick. Otherwise, the thinner pieces will be baked before the thicker ones are done and they will get too brown and burn around the edges, which will not be nice. Step 2: Mix together some olive oil and some spices, pour the mixture over the pretzel pieces and rub thoroughly. Step 3: Bake the chips for 10 to 15 minutes depending on size. Leave to cool and serve. 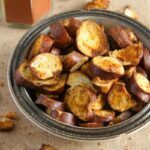 How to spice the pretzel chips? Most of the times I keep it simple: sweet paprika powder and some pepper. I only use salt if the pretzels are unsalted. In Germany you can buy soft pretzels from the bakery, that are either unsalted or sprinkled with large salt flakes. I usually buy the salted ones and remove some of the salt flakes, they tend to be too many and mostly concentrated on one half of the pretzel… In this case salting the pretzel chips is not really necessary. However, if you use unsalted pretzel, I recommend adding a good pinch of salt to the rub mixture as well. Other spices you might use are any kind of curry powder you like, hot paprika powder or cayenne pepper for a hot alternative, dried herbs like rosemary or thyme, even some garlic or onion powder, if you like. Experiment and find your favorite spice mixture. 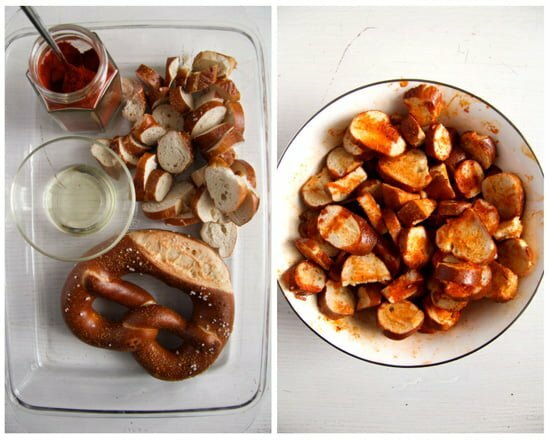 How to serve the pretzel chips or pretzel crisps? We have them as a snack most of the times. I make them shortly before guests arrive or before one of our family movie evenings and munch on them while we watch the film or chat to our friends. If you are having them with friends, don’t forget the cool beer. And you could also serve some dips like this Camembert dip, this Hungarian feta dip or some hummus. Or you could have the pretzel chips with soup, that’s the way we had them the last time. I made this simple carrot soup and served it with pretzel chips. It was a wonderful combination! The pretzels are best served once cooled on the day you make them. Otherwise, they will keep for several days and keep most of their crispiness, if you you pack them in an airtight container. Preheat the oven to 180 degrees Celsius/ 360 degrees Fahrenheit. Line a baking tray with baking paper. 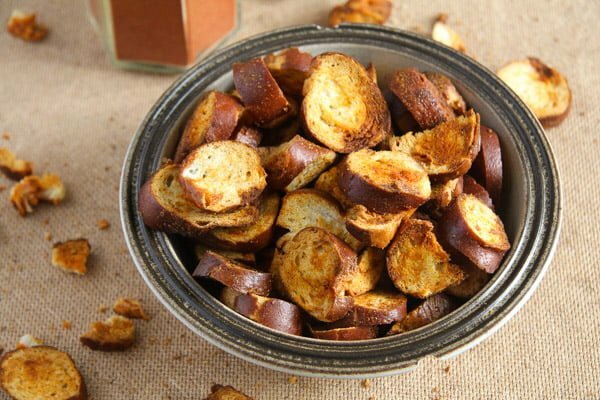 Cut the pretzels into regular slices, about as thick as a finger. Cutting regular pieces is very important, probably the only thing you have to do carefully when making the recipe. The actual size of the pretzel chips is not that important, you can cut them thinner or thicker, depending on your taste, just make sure that they are all equally thin or equally thick. Otherwise, the thinner pieces will be baked before the thicker ones are done and they will get too brown and burn around the edges. Give the pretzel pieces to a bowl. Mix together the oil and the spices. Pour the mixture over the pretzel chips and rub well. Give the chips onto the prepared baking tray making sure that they lay in a single layer. Bake for 10 to 15 minutes, depending on their thickness. Start checking after 10 minutes. 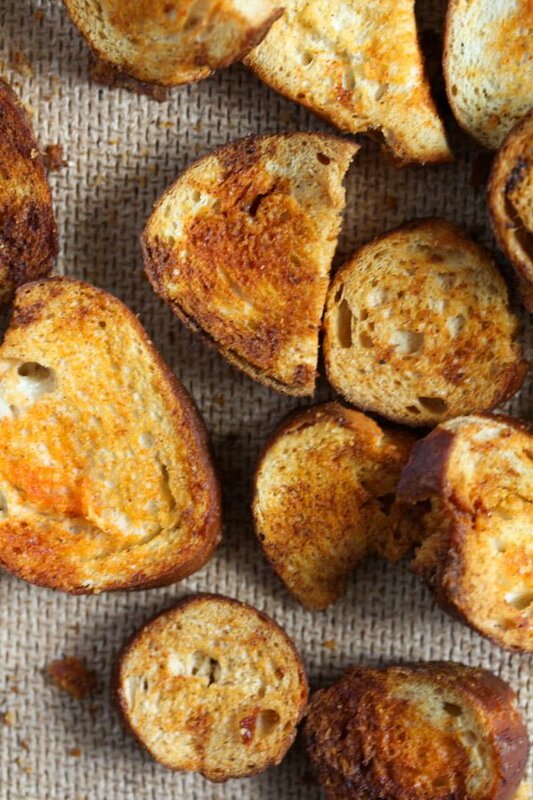 They should be completely crisp and golden brown. 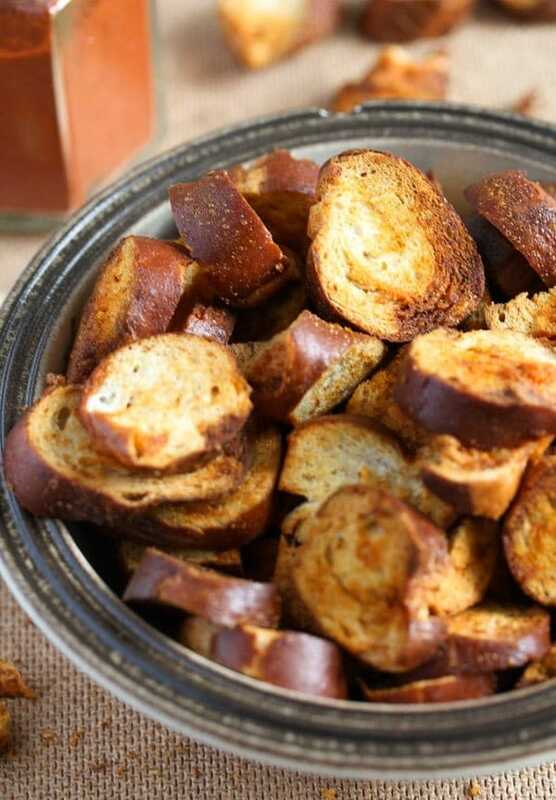 If the pretzels are sprinkled with flaky salt, you can leave out the salt in the recipe. Otherwise add one good pinch of salt to the rub mixture.